FISHERIES Minister Michelle O’Neill has announced that more funding has been secured from the European Fisheries Fund to provide a further 345 Personal Floatation Devices (PFD’s) for local fishermen. 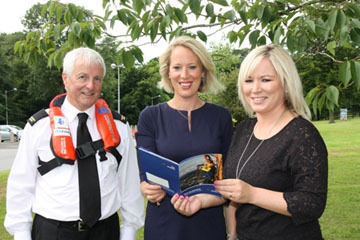 Fisheries Minister Michelle O’Neill pictured with Superintendent Maurice Lake from the Fishermen’s Mission, and Dr Lynn Gilmore, from Seafish NI at the launch of the funding for Personal Flotation Devices. The PFD’s are lightweight, easy to wear and provide protection without impeding movement. Earlier this year funding was also secured for 710 PFD’s which were distributed to local fishermen through a series of organised safety events in Ardglass, Kilkeel, Portavogie and Cushendall. The Minister said: “I am delighted with the success of this project. Indeed since I launched our initial investment earlier on in the year they have already gone on to save the life of a local fisherman, whose boat sank off the County Down coast. Minister O’Neill added: “This is good news for the fishing community and although there has been a strong uptake from fishermen there are still some who have not come forward to be supplied with a Personal Floatation Device. It is critical that all fishermen do not miss this opportunity. Over the coming months the Fishermen’s Mission, with the support of my department, will be organising a number of distribution and training events for fishermen to avail of these lifesaving devices.